Texas Conservative Republican News: Urgent: Texas Rangers and Federal Agents have Gun Batttle on Texas/Mexico Border - Send in the Troops Governor Perry! 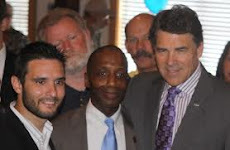 Urgent: Texas Rangers and Federal Agents have Gun Batttle on Texas/Mexico Border - Send in the Troops Governor Perry! The Texas Department of Public Safety has just announced that the Texas Rangers and Federal Agents came under HEAVY FIRE from Mexico today. Few details about the early morning shootout in Hidalgo County were immediately available. The shootout began after U.S. agents patrolling in boats tried to seize a drug load on the Rio Grande, Texas Department of Public Safety spokeswoman Tela Mange said. Mange said she could not disclose whether any U.S. officers were struck or injured. She said the agents came under "heavy fire" but would not say how long the ensuing shootout lasted.